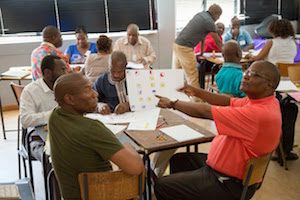 The African Institute for Mathematical Sciences Schools Enrichment Centre (AIMSSEC) is a not-for-profit organisation providing outstanding professional development courses for mathematics teachers, subject advisers and field trainers in South Africa, introducing new mathematics teaching skills, improving subject knowledge and empowering teachers from disadvantaged rural and township communities. Learning is through guided discovery, with an emphasis on understanding, mathematical thinking, discussion, collaborative learning and challenges rather than just mechanical practice. Learning how to learn and to take responsibility for one’s own learning is of paramount importance. 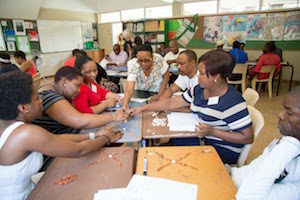 A distinguished team of more than 50 international mathematics education experts volunteers on the residential courses and support local staff and students. Graduates also follow an AIMSSEC professional pathway by becoming teaching assistants, co-lecturers and associate lecturers on the new courses. Since 2004, 1707 teachers have completed the three-month Mathematical Thinking course. The two-year ACE course (instituted in 2009) now boasts of 215 graduates. This Aiminghigh network is an online network of mathematics teachers designed to support lifelong learning, offer resources for teaching and encourage mutual support through the sharing of ideas and advice which each other. Mathematics educators around the world can contribute to the discussions on mathematics teaching using the online forum. Joining the Aiminghigh network is free. If you would like to become a member, please send an email to aiminghigh@aimssec.ac.za. The AIMSSEC lecturers work tirelessly to improve teaching and learning by delivering teacher workshops. Intervention for learners includes master classes at AIMS, maths clubs, public lectures, tutoring sessions and role modelling. The FaSMEd is a consortium of science and mathematics experts from seven European countries. South Africa was the only developing country chosen as part of the consortium. AIMSSEC was nominated to represent South Africa. In addition, several AIMSSEC researchers contribute towards mathematics education locally, nationally and internationally.